Inherited & Salvaged: Family Portraits from the Straits Chinese Collection presents over fifty painted and photographed portraits donated to NUS Museum. Originating from individual and family collections, and others acquired from antique and ‘karung guni’ dealers, the portraits date from the 19th to early 20th centuries and capture some of the earliest visual representations of Peranakan Chinese in Malaya and the Dutch East Indies. Through this assemblage, the exhibition explores early portrait making industry in the region, the social and cultural context sustaining such artistic patronage, and contemporary motivations in collecting and preserving these works. The Recent Gifts exhibition presents a modest selection of works acquired from two artists, the estate of the late Lim Mu Hue (1936 – 2008) and Jimmy Ong (b. 1964). While Ong’s Chinatown Suite brings together sketches completed between mid-1980s and early-1990s, Lim’s body of work presented were completed over a broader period beginning in the late 1950s. These works are accompanied by supporting materials including photographs, personal artifacts, and other documentations. Collectively they form a growing body of resources that facilitate research into the artists and their practices, Singapore art, and their contexts. [Image: (Top) Jimmy Ong, Chinatown Suite XXI: 5, “30 Minutes” - Self-portrait, 1985, Ink and charcoal on paper. Free Admission. Visits are by appointment only. This exhibition presents the Malam Di Jari Kita series of batik and cyanotype print artworks arising from the collaboration of two contemporary artists, Samantha Tio (Mintio) and Budi Agung Kuswara (Kabul), and batik makers of the Sido Luhur group from the central Javanese village of Kebon Indah. Batik is a cultural icon of Indonesia and research on this textile art has centered on symbolisms and production techniques. Relatively less is known of the industry’s workforce who are mostly women working from their homes. Portraits of the batik makers taken by Mintio are printed on cotton fabric with a process known as cyanotype. The images are set against a backdrop of motifs designed and executed by the ladies from the batik group. The combination of portraiture and batik patterns creates an association between the sitters and their profession, at the same time bringing attention to their skill and giving recognition to the crucial role they play in the industry. In 1963, Marco Hsu, art critic and regular columnist who contributed articles about the history of Art in Malaya, published a series of essays on the cultural history of the people of the Malayan Peninsula, which were compiled into a book published in Chinese in the same year, A Brief History of Malayan Art. Through his analysis of the development of art history in Malaya and Singapore, Marco Hsu raised questions of Malayan identities and culture for the young nation. The NUS Museum presents the exhibition on the occasion of the 50th anniversary of the book’s publication, and the Museum will use art and artefacts referred to by Marco Hsu to highlight questions of identity and nation building raised on the eve of an anticipated political development of significance: the creation of a merged, independent nation. SHIMURAbros, a sister/brother duo of Yuka (b. 1976) and Kentaro (b. 1979), are interested in the history of cinema and the deconstruction of cinema as a medium, utilizing various forms of films and incorporating sculpture and installation to create new expressions of imagery that prompt the somatic senses of the audience. Straddling the realms between the archaeology and histories of film and the moving image, the SHIMURAbros discovered that one of the earliest films to be made in the genre of the travel film was titled Road To Singapore, a 1940 comedy flick featuring Anthony Quinn. 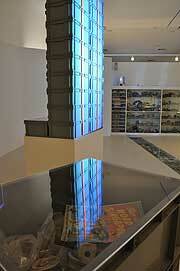 Working with the Sherd Library of the Lee Kong Chian Gallery, the artists focus on the archaeological materials of Dr. John Miksic and produce a video-based installation using plastic crates that are used to house the archeologists’ shards. ROAD MOVIE – Road to Singapore is a film that follows the trajectory of movement recorded as a shadow of the moving subject, opening a site where contemporary audiences can (re)live the feelings of the archaeological object and the people related in its history. ROAD MOVIE was originally presented as part of OMNILOGUE: Your Voice is Mine, an exhibition which featured six contemporary Japanese artists working with themes related to Singapore. It was co-organised by The Japan Foundation and NUS Museum from 19 January – 21 April 2013. 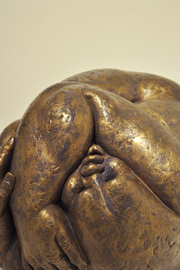 Presented as an open storage and second in a series of permanent exhibitions on artist Ng Eng Teng, Sculpting Life brings together a range of works that facilitate a mapping of the artist’s history and his explorations. Gathered are early pieces completed during his formative years at the Nanyang Academy of Fine Arts (Singapore), Stoke-on-Trent College of Art (UK) and as a ceramic designer in Ireland from the late 1950s and 1960s; early explorations in ceramics and ciment fondu that foreground the mature phases of his practice; and seminal sculptural pieces that marked his importance among a generation of Singapore artists emerging during period of the 1960s. Documentations, drawings and maquettes will accompany the selection, providing an expansive view of his practice. The exhibition is also devised to prompt a mapping of themes and conceptual concerns of the artist. Significant among these, explorations into the human condition through an evolving articulation of the human form and their emotive potentials, and by doing so, he invests into them oblique and direct references to questions of self and identity. The Lee Kong Chian gallery features the Chinese Art Collection and Export Ceramics from the Lee Kong Chian Museum. The permanent display is supplemented by ceramics from from the South and Southeast Asian Collections and the archaeological collection of Dr John Miksic. These exhibits are complemented by temporary exhibitions, conceived to engage the permanent collection critically. The Chinese Art collection consists of bronzes, ceramics and paintings, gathered to represent the expansive history of Chinese art. The nucleus of this collection was established and developed at the Nanyang University in the 1970s with significant expansion in the 1980s under the newly inaugurated National University of Singapore (NUS). This permanent display of Chinese Art focuses on Chinese ceramics and its development, categorising objects in relation to centres of productions and periods. A selection from the collection is featured in Collecting Histories, presented within the main gallery in open-storage format alongside ceramics collected by the then University of Malaya and University of Singapore. Collecting Histories comprises Southeast Asian and Chinese ceramics sourced from the region and mostly acquired between 1955 and 1973 - a period significant in the development of Southeast Asian art and ceramics as a field of study - led by the scholarship and research of the successive curators of the University of Malaya Art Museum, Michael Sullivan (1955-1960) and William Willetts (1963-1973). The third permanent component to the gallery is the Sherd Library, which presents a selection of archaeological materials from the collection of Dr. John Miksic, a living accumulation of an archive developed through his extensive work across the region since the late 1970s. Tuesdays 6.30pm - 7.30pm, Thursdays 10am - 11am & Saturdays 11am - 12pm. Baba House is a heritage house which facilitates research and learning about the Peranakan community and its evolution. It exhibits the community's material culture in a domestic context, providing the unique experience of visiting a Straits Chinese family home dating back to the early 20th century. 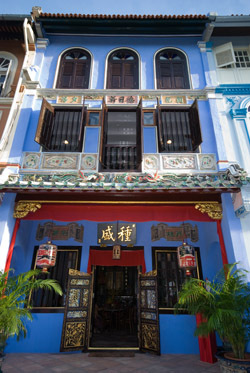 The Baba House aims to promote a wider appreciation of the Peranakan identity, history and culture, as well as architectural traditions and conservation efforts in Singapore. The Gallery on the third floor hosts temporary exhibitions featuring various Peranakan themes.